Most everyone would like a lush, green lawn. But if your grass grows patchy in some areas, it can look more lackluster than lush. A sparse lawn can be a sign of drought stress, partial shade, diseases, insects or even poor cultural practices. The solution to growing a thick, green expanse of lawn is to overseed your lawn with more grass. 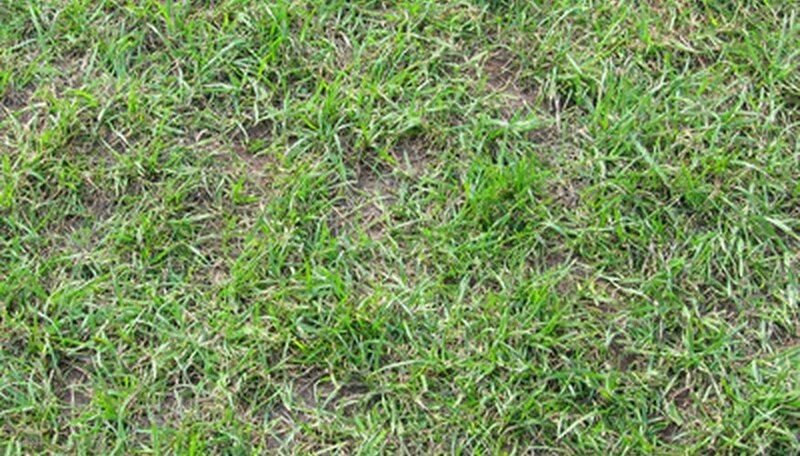 Overseeding is simply putting grass seed down over an existing lawn to get more grass. Mow your grass to a height of 1 ½ inches to ensure that light can penetrate the grass and make the seed germinate. Rent a core aerator from a garden center to fully aerate your lawn. This will allow water and air to penetrate into the soil of your lawn past the thatch of grass roots that typically exist on the surface of the lawn. Set the core depth of the aerator and pass it over the lawn in sections as if it were a lawn mower. Leave the removed cores on your lawn to dissolve. Rent a vertical mower from a garden center. Set the depth of the blades and push it over your lawn in sections to gouge out strips of lawn and allow the grass seed to come into contact with your soil. Purchase lawn seeds that are adapted to overcome the problems that have caused your present grass to grow patchy. For partial shade, St. Augustine is a good grass choice. Grass that is thin due to summer heat should be overseeded with a drought- and heat-tolerant grass such as zoysia or Bermuda grass. For winter greenery, rye grass is a good choice. Pour your seed into a seed broadcaster and distribute it over your lawn by walking the seed broadcasting machine over your lawn in strips. Keep your lawn moist while the seeds germinate with frequent, light watering. Water up to twice daily for the first 14 days, then gradually reduce the watering times until you are watering with an inch of water once every 10 days. To determine an inch of water, set a tray next to your sprinkler. Shut your sprinkler off once the depth of the water in the tray is 1 inch deep. Continue to mow your grass ½ inch high so that light will reach the seeds. When the seedlings reach 1 ½ inches high, gradually raise your mower until your final mowing height is 3 inches.